Once you’ve got a hypothesis in hand, it’s time to get testing. 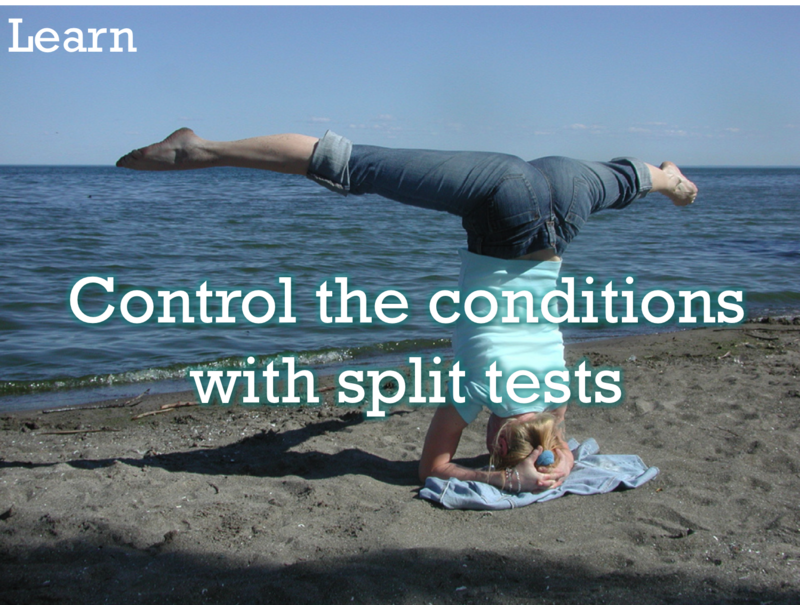 Split testing is a great way for you to feel comfortable that the result you observe is a result of the thing you are testing and not some other random factor. For example, if you ran one search ad for two weeks with a conversion rate of 3%, then another for two weeks with a conversion rate of 5%, could you really be sure that the second ad won because it was better? Maybe it was because it was two weeks closer to Christmas. Or maybe it was because you had a site outage the first two weeks. Or you had some good PR the second two weeks. But if you test the two ads against each other in a split test, alternating them evenly to a randomized population, then all those other factors don’t matter, and you feel comfortable saying the second ad was just better. So setting up split tests helps you minimize extraneous factors; you can minimize them even further by paying careful attention to how you set up your tests. Make sure you limit the differences in your two marketing assets to just the thing you want to test. Say you want to test whether having a call to action in your search ad improves response. What would be wrong with these two ads as your test subjects? The problem is, although one ad has a call to action (“Try It Now!”) and one ad doesn’t, there are also other differences between them. The headlines are different, the key messages are different, one is longer than the other. If what you really want to learn about is how effective a call to action is, you’re not going to get at it this way. You might see a difference in performance, but you won’t be able to confidently attribute it to the factor you’re looking at. And then you’ve gone and wasted time and effort by setting up a test that didn’t teach you anything. Those happy scientists in the last slide? That makes them cry. EVERY TIME. Don’t make the scientists cry. This doesn’t mean, though, that all split tests must involve tiny little tweaks— it depends on what you’re testing. If you’re designing banner ads and you really don’t have a sense for whether a playful overall effect works better than a serious one, you’ll be putting out two pretty different ads. Once that larger question is answered you might move on to smaller changes of the concept, until eventually you’re changing background color or testing different pictures. And then you might just want to test the whole concept again against another concept. The key is to control non-test factors as much as possible, so that you feel confident that you are learning something real. Next up: what to do when split tests aren’t possible. I feel confident that I understand the principle of not changing multiple variables at one time. And I feel confident that I understand that one has to take a step back and make a judgement call about the style and approach in a banner ad (jokey text with bright colours versus serious text and muted palette). Unbounce is attractive, and Optimizely even more so. Except the price. I could create a couple of Worpdress landing pages on my own site, add in a Gravity form – but how would I launch them both with A/B to see which gets more click-throughs? If you find something that works, let me know– maybe you could write it up.